A million of them could live in an acre of soil. They can "eat" their own weight in soil and organic waste every day. As they "worm" their way through the soil, they open up tunnels where oxygen can go. Their movements loosen up the soil underground, making it easier for roots to grow. Best of all, their "poop" enriches the fertility of soil like no other! They eat dirt and bugs . . . and leave the soil behind them much improved for plant life. Worms are nature's power recyclers! And you can grow your own to improve your garden soil and have fun investigating these amazing creatures. It takes at least three months to create worm compost. It's better to start a worm ranch in the spring, keep it going all summer and into the fall, and release your worms "into the wild" in mid-fall in your garden. Then, next year, you can "visit" them all the time, though some will migrate away from your garden, and that's OK, too. Start collecting worm food - compostable kitchen scraps. Order your worms, and get the bin ready before they arrive. A kids' garden club could start by assigning each student to collect veggie scraps with a compost bin under the kitchen sink for a couple of weeks. Then come together to fill one or more prepared containers with a few bags of store-bought compost or dug-up dirt, your club's compost, and then the stars of the show - either worms that the kids dig up here and there, or better yet, mail-ordered red wrigglers that you "let loose" in your ranch to grow, eat the compost, have babies, and become Worm Nation that you can eventually turn loose in your garden. Composting is a great way to help the environment and get free food for your worms. 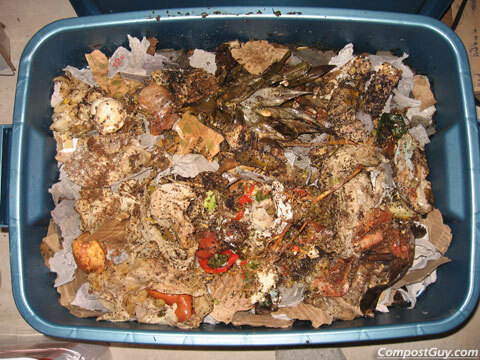 Each student can ask parents to commit to putting a plastic storage container under your kitchen sink and start collecting potato peels, cut-up banana peels, coffee grounds, crushed eggshells (important - worms need calcium! ), chopped up apple cores and other compostables. No meats, dairy, breads, processed foods such as potato chips, or other garbage. Absolutely no salt! Worms don't seem to like citrus fruits or peels. The students can bring in their containers when full to add to the worm bin. Also helpful is newspaper cut in 1" wide strips and moistened, torn-up paper napkins, or crushed dry leaves or sawdust, also moistened. If you really get in to it, you can organize a compost collection system at lunch in your school. Your garden club can set up a 4' x 8' worm bin near the school garden, and set up a system in which the student body is educated on what kinds of lunch scraps make good worm food. For example, no meats, cheeses or breads - but bring on the banana peels, apple cores, crushed eggshells, coffee grounds, and so forth. Also good are shredded newspaper and colored paper. Your club can collect, weigh, process (chop up small) and chart food waste daily, adding water as needed to keep it moist. You might want to pick a spot for your worm ranch that is in the shade, for worms do best at about 65 to 75 degrees, and can "fry" in too hot and sunny of a spot. If your area gets into the 80s and 90s often, you might consider moving the bin inside for a while. It is important to drill or poke about 20 ventilation holes about a quarter-inch wide in the top bottom of your worm bin, and every few inches in the sides, to let in air and let water out. Don't worry about the worms escaping; they won't, if there's food in the bin. You don't want to completely fill your container, for it will be too heavy to move. For quantities, try to have half compost or aged manure, and half collected kitchen waste or other materials. You want the worms' environment to be slightly moist, but not soggy and wet, like a wrung-out sponge. So you need good drainage, and you probably don't need to add water often. You should collect the "worm tea" - brown runoff water - from the bottom by putting your bin on bricks or blocks in a big waterproof tray or trough. That "worm tea" is a great liquid fertilizer for other plants. Fill the container about one-fourth full with bagged compost or dug-up dirt, then add an equal amount of the compostable materials, and stir. Shoot for about half dirt, half other ingredients, to help the worms' digestion. You don't want their food to be too "rich"! Stir it up; the worms will not want to live near the top because that's too light and too hot; they need to have some of their food at all levels of the bin, including at the bottom. Every two or three weeks, add more compost or manure, and compostables, onto the top. 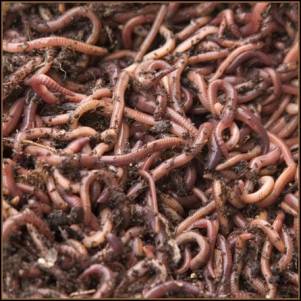 The worms will gradually move up to the next level as their food supply runs out. As they convert the substance into worm compost, it will grow fluffier and lighter. You should probably add more food six times in a summer, every two or three weeks, or until your container is full. Have the students research the life cycle of the worm, and they will discover that, when they pour their bin out onto their garden, they are probably pouring countless worm cocoons for next year along with the visible red wrigglers they are letting loose. Once you get going with your worm ranch, you can do all kinds of experiments: try finding out if worms like lighter colors or darker colors by putting them on plates with different colors of water droplets. The kids will find that the worms like dark colors more, and will realize that their natural habitat is below ground, so naturally, they don't like light. Another idea is to start and grow bean seeds in three kinds of soil: straight potting soil, straight worm compost, and a mixture. Then measure which plants are faster growing, have more leaves, produce beans first, and so forth.